Tetsuzo Fujiwara the first had been using the potter’s wheel from the age of 11 at a Kyoto Shimizuyaki pottery. One moonlit night, he saw a raccoon dog drum his belly, “pon poko pon”. 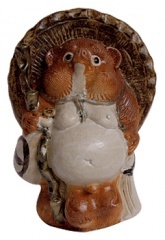 Struck by that figure, Tetsuzo Fujiwara began to earnestly make raccoon dogs to somehow recreate that figure through pottery. Taking advantage of the specialty of Shigaraki, which was large pottery, he made life-sized raccoon dogs one after another. 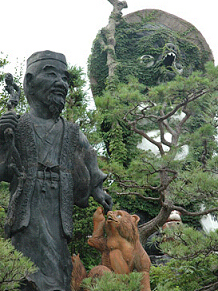 When Emperor Showa visited Shigaraki in the 26th year of the Showa period, he was so moved by the raccoon dogs holding Japanese flags and lining the road in welcome, that he wrote a poem about it. 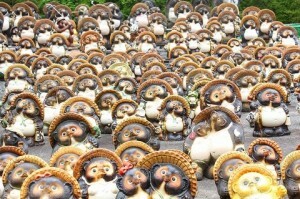 “When I was a child, collecting of those Raccoon Dog Ornament. The story was reported by the media. Shigaraki raccoon dogs immediately became famous nationwide, and were touted as “having good luck” and being “charming and cute”. They were soon established as a famous local product. In his hometown Shigaraki, Rian the first taught how to make raccoon dogs and devoted himself to its development. The craftsmen who trained under Rian started making raccoon dogs in their own potteries one after another, and today there are over 20 potteries that make raccoon dogs. Mr.Kazuaki Fujiwara the third continues to uphold tradition and bake the original raccoon dogs that he adheres to as a craftsman. 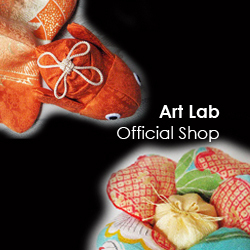 Precious works from the first generation to the third are displayed in his studio, and you can see the history of the artistic Shigaraki raccoon dogs.